Sorry for the distance between posts but it came due to a time of great departure. Well, not really but I did go to Ireland and Northern Ireland this past weekend. Along with my roommates I took a flight from London Heathrow Wednesday night to Dublin. The flight itself only took about an hour but we were delayed for over an hour, pushing our arrival into Dublin airport to about 1 a.m.
We hopped in a cab after "Rushing to the cash machine, still a bit mashed and lean, Then of course a mandatory car, drives by and splashes me. Get there the queue's outrageous, ladies taking ages. My rage is blowing gauges, how longs it take to validate your wages?At last my turn comes, press the 50 squid button . . . Insufficient funds." Not really. I would like to think the english rap group The Streets for that. We took the cab however, to the Ashfield House, a hostel in cenral Dublin. Nothing would have prepared me for what waited there. I have never been one to be squeemish in any circumstance, however, in this case we arrived out front to the $15 a night hostel, decorated with spray paint on the outside, dark windows and a night club next door. We entered and checked in at the front desk and then ventured up the rickedy steps to the "Ashfield Room," an 18 bunk room filled to capactity. And, knowing that it is now well past 1 a.m. everyone is asleep. It was a weird sensation sleeping in the same room with all of those people and honestly it took some time for me to fall asleep, but the second night it was just fine. We awoke the first day and ate breakfast, met some girls from California in the kitchen of the hostel and then left for the information centre of Dublin. We found it, in an old church, bought tickets to the self-guided tour of the Guinness storehouse and then departed for the Guinness plant. We arrived and took the tour, following the signs with information about the process that goes into the production of the distinct beer. We traveled up 7 full levels of information in the former storehouse for the Guinness product. 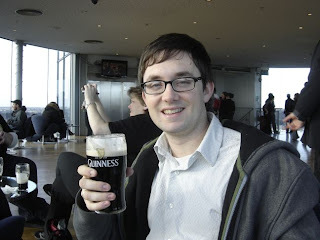 Once at the top we were rewarded a complimentary pint of fresh Guinness and view to die for. From the top of the "gravity bar" the view included the whole of Dublin, the sea and the Wicklow Mountains. After we took our time we ventured around Dublin the rest of the day until we settled early and tired back at the Ashfield House for another night of sleep. Awaking earlier the second day we took off for Howth Point, a northern, more-rural part of Dublin, which I had read about online and in a magazine. For the 2 Euro ticket it was well worth the trip as my expectations of the countryside of Ireland were met. It was an extremely blowey day and therefore the walk out along the pier was quite challenging. 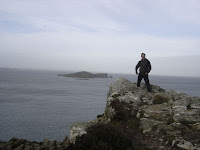 When we got there we snapped some pictures and surveyed the wonderful scenery; the island a mile off shore, the rolling hills back toward Dublin and the rocky bluffs to the North. We spent the entire day climbing and walking around this charming village before eating a late lunch at Beshoff's Fish N' Chips and heading back to Dublin prior to sundown. That night we each bought a round of Guinness at The Berkely, a pub right across form our hostel for the night. The sleep that night was interupted often abruptly by two guys speaking some slavic language and intended on reading each other comic books at 4 a.m. I awoke at 6 a.m. and ventured to the Busarus bus station to catch a 7 a.m. bus to Belfast in N. Ireland. I slept a lot of the way to Belfast and arrived at around 9:30 a.m. Assessing the state of Belfast is like talking about a half-finished canvas. The city, which has had a history of turmoil, is rebuilding its waterfront and creating a city accessible and attractive to tourists and to the people who live there. None the less I walked around from one end of the city to the other seeing the beautiful city hall, Queen's college, and the famous botanical gardens. It was worth the trip but was not near as tourist friendly as Dublin. Saturday night I arrived back in Dublin and headed straight to find something to eat. I ended up at a pub and got a burger and chips with a Guinness while I listened to some traditional Irish music. Heading into the weekend we did not know that the weekend we chose out of the blue, was the Irish Trad Festival. Trad, for those of you not in the know, is the Gaelic word for the traditional Irish music that we all know. After I finished eating I sat down up front and met an older gent who inquired into where I was from. His name was Barney and lived 10 miles outside of Dublin. We talked about the pub, school and where I lived and he listened with much interest. 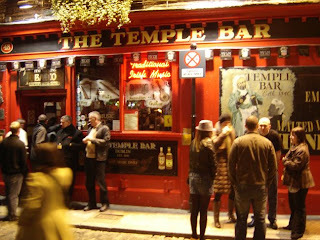 Afterword, I met back up with Alex and Hunter and we walked around the rest of the night throughout Temple Bar area, listening to the Irish music and having a good time. By midnight I was exhausted, so I retired to my bed at Barnacle's Hostel on Temple Bar Lane, in preparation for the flight the next day.